Ian Curtis (in case you didn’t already know) was the lead singer of Joy Division. He committed suicide in 1980 after which the surviving members went on to form New Order. Control, a biopic of Curtis’s life was released earlier this year. I went to see it. 1. It brings the music to life in a way the albums and CDs never could. I never went to a Joy Division concert but this film feels like the nearest thing. I cannot tell if what I am hearing is genuine Joy Division or a soundalike2. Someone earnt his money that’s for sure. 2. I remember little about Ian Curtis’s death. I knew who Joy Division were. I knew that all sorts of people in the know thought that they would be the next big thing. I think I had listened to Unknown Pleasures. I think I had because while discussing its gloomy content, a schoolmate advanced the opinion that Curtis’s talking about depression could help the rest of us. It’s not exactly the thing you would say after Curtis’s death. 3. One of the great tragedies of Curtis’s suicide is that it launched Love will tear us apart to a wider audience. This was a pity as it meant that Joy Division’s weakest track become its best known - giving many a totally false impression of what their music was like. It would be a bit like basing your opinion of Paul McCartney on The Frog Chorus1. Or the career of Field Marshal Montgomery on Arnhem. 4. 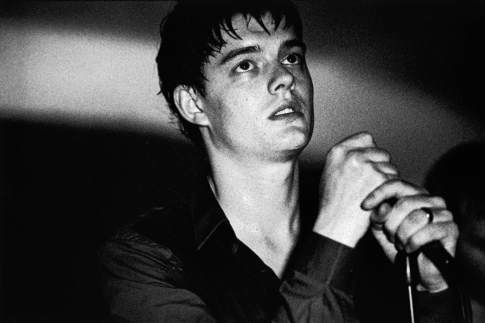 Sam Riley does an amazing impersonation of Curtis. But - and this is by no means a criticism of Riley - at the end we still have no clear idea why he killed himself. We understand that he is desperately torn between the family man and the rock star - a tear embodied by the two women in his life - his faithful wife and his rock chick mistress. In the end we are able to feel sympathy for all of them. 5. The film also fails to explain the origin of his gloomy lyrics. He does not appear to have suffered from a history of depression. Unknown Pleasures and to a lesser extent Closer evoke a world of darkness, decay, isolation, fear and desperation. But I get very little sense of this world from the film despite being filmed in black and white. Even the constant reminders that Curtis came from Macclesfield fail to invoke the expected feelings of despondency. 6. Samantha Morton as Deborah Curtis is fantastic. 7. Tony Wilson is credited as Executive Producer. Tony Wilson comes off well. Surprise, surprise. May he rest in peace. 1. Actually, I quite like The Frog Chorus. 2. According to Wikipedia one of the tracks was indeed recorded by the actors. Kudos to them. Yes, and I rather like “Love will tear us apart”. I must catch the film. It sounds good.